Released in 1978, "Road To Ruin" followed three iconic "1-2-3-4" Ramones albums of punk rock heaven. By now, they felt the need to show they weren't not just three-chord wonders. The "new wave" had begun, and acts like Elvis Costello, Talking Heads, The Jam and The Clash were diversifying and showing considerable songwriting skills. Maybe The Ramones felt they had to compete in similar fashion, or maybe they just fancied trying something different. 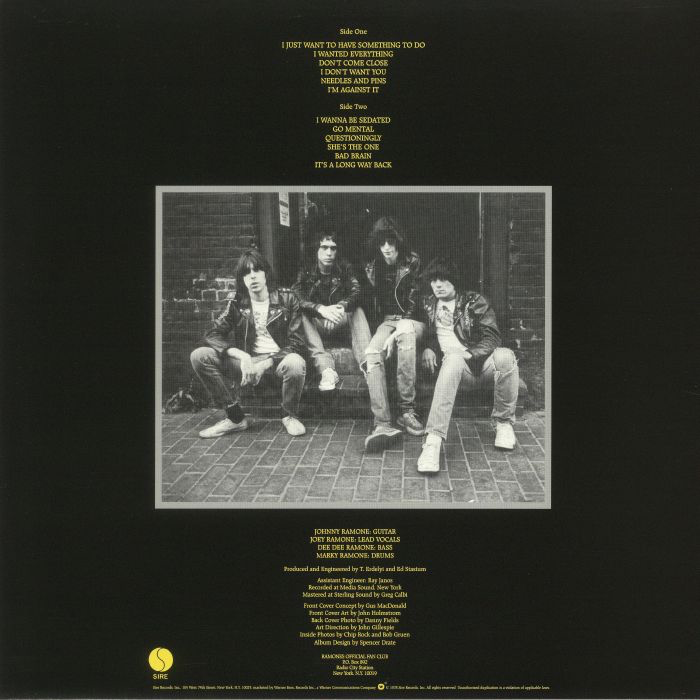 Either way, this album saw the first real Ramones ballad in "Questioningly" and "Don't Come Close" was a single which had a new wave style melody to it - certainly not a two minute fist pumper/pogoer. The cover of The Searchers' "Needles And Pins" ploughed a similar furrow. Even the catchy "I Wanna Be Sedated" seemed a little more singalong and a little less three chord guitar thrash, despite its repetitive structure. Only twelve tracks on here as opposed to the fourteen on the previous three. Those songs must be getting longer! The Ramones were going all Led Zeppelin. There are still some copper-bottomed punkers in "Go Mental" and "Bad Brain", which sees the band revisit their mental health obsession. "I Don't Want You", "I'm Against It" and "She's The One" are a bit Ramones-by-numbers, to be honest. Nothing really memorable about them, however. Despite that, I still have a nostalgic affection for this album. I remember buying it on the day of release back in 1978 and being a bit underwhelmed, though, in comparison to "Rocket To Russia". 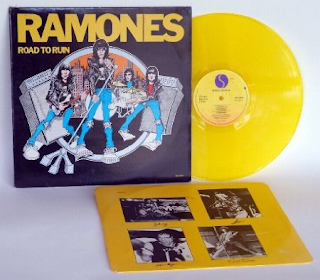 The yellow vinyl was mightily impressive though, so much so that I still always remember it as The Ramones' "yellow album" and the cover art certainly adds to that effect. Still, The Ramones are The Ramones - there is always something to enjoy. This 40th Anniversary remaster is not as easily available as the previous three in the series, although a digital download is on amazon, as well as a vinyl/CD set. As with the others, the question of whether anything by The Ramones needs remastering is a valid one. However, listening to this, the remaster of the original sounds pretty impressive. 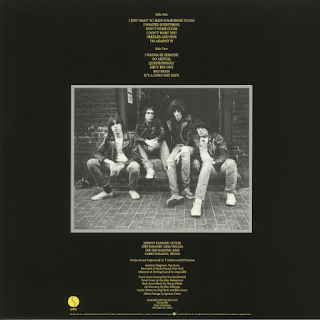 Listen to those cutting, slashing guitars right at the end of “I Just Want To Have Something To Do” (the first sign of The Ramones playing anything more than the riff chords). The bass on “I Wanted Everything” comes over full, muscular and resonant. “Don’t Come Close” just explodes right out your speakers with a big bassy boom. “Needles And Pins” also has some excellent bass too. It is on the “ballads” that the bassy remastering is most apparent, and “Questioningly” provides another example. The alternative mixes are, rather like the ones on the previous three 40th Anniversary re-releases, even more bassy and warm-sounding. The slight tinniness that the original album always had is not present and the album sounds more like it maybe should have done. Sort of purer. I really enjoyed listening to these. Many people may not notice a difference, but I am sure most Ramones-oholics will. “Don’t Come Close” has none of those high-pitched additional guitar twangs. It is played in pure, typical, chugging Ramones style and is very appealing for it. Tracks like “I’m Against It”, “I Don’t Want You” and the excellent “I Wanna Be Sedated” all sound great. The latter is beautifully punchy and bassy. “Go Mental” just sounds raw, edgy and somehow better than the original. In a way the whole “alternative” album does. The same was certainly true of the “Leave Home” and “Rocket To Russia” alternative mixes. Something pure and essential about them. I am not sure how the “Rough Mixes” and “2018 mixes” differ, however. Both sound fresh and vibrant. 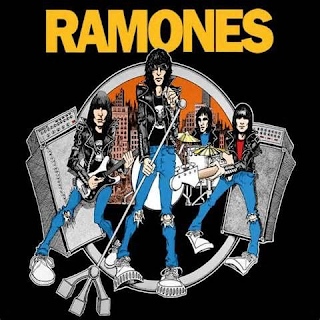 The ‘Rough Mixes” contain a frantic, breakneck “I Wanna Be Sedated” which is the very essence of The Ramones. The same goes for “Don’t Come Close”. The live tracks from 31 December 1979 are raw and lively as you would imagine. The sound quality is ok, not outstanding, but perfectly acceptable.